The second edition of Live Cinema Festival will take place in Rome from September 4 to 12, 2015 in Piazza dell’Immacolata, in San Lorenzo neighbourhood. In the first edition – that took place in Teatro Quarticciolo, September 2014 – every evening was sold out and the audience really appreciated the festival as well as the great integration with neighborhood’s social disposition. Live Cinema Festival was selected among the “Estate Romana 2014” event presented projects. Thanks to the success of the first edition, for the second one we decided to extend the event’s duration from 4 to 9 evenings, as well as the number of the artists collectives hosted, that has been increased from 8 to 18 for a total amount of 31 participating artists. We also expanded the capacity of the location, passing from the numbered seats of a theater to the open air of one of the most popular squares in Rome: Piazza dell’Immacolata, a strong meeting point, which could become a new place dedicated to culture and an example to enhance the potential of San Lorenzo – one of the most populated and lively neighborhood of the city. Live Cinema Festival is a live performing exhibition that explores and promotes all the artistic trends linked to “Live Cinema” term, through 18 performances presented by 31 artists which made this narrative technique their stylistic code. In the past, the concept of “Live Cinema” was mainly used to describe the live musical accompaniment of silent movies. Nowadays, “Live Cinema” means an experimental narrative technique applied to audiovisual performances, that produces a simultaneous and in real-time creation of sounds and images in which the traditional guidelines of narrative cinema, represented by the subjectivity photographed by the camera, expand in a wider horizon. “Cinema” is here intended as a simultaneously creation of images and sounds that interact each and take shape in a synaesthetic approach that results in audio-video performances – realized in real-time – in which the viewer’s perception is in constant tension between experimentation and re-enactment. 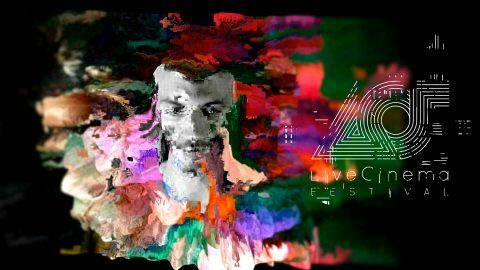 Live Cinema Festival is an artistic and cultural project that aims to contribute to the enhancement of one of the most popular and vibrant city’s areas. Among its main objectives, it aims to bring young people closer to cultural activities that could help them to separate from the danger of the street and to provide artistic incentives that could influence positively and decisively their lives. Live Cinema Festival is part of the AVnode project. | LPM 2015> 2018, a large scale cooperation project co-funded with the European Union cultural program “Creative Europe”, with 14 events a year for three years including 13 partners from 12 countries: Austria, Belgium, Czech Republic, Germany, Greece, Hungary, Italy, Spain, Turkey and the United Kingdom. Live Cinema Festival 2015 is supported by Roma Capitale, in collaboration with SIAE, and it’s part of “Estate Romana 2015”. Its purpose is to enhance, through the exhibition of 31 artists, one of the city’s suburban areas which, thanks to a program that combines emerging and well-known artists, could become a new center of cultural aggregation. Live Cinema Festival is promoted by Flyer Communication and it’s co-produced with LPM – Live Performers Meeting, FLxER.net, Linux Club, Free Hardware Foundation and Improvearts and approved by AVnode.